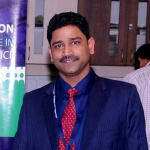 Dr. Siddharth is a popular General Physician in Babusa Palya, Bangalore. He has over 14 years of experience as a General Physician. He has completed MBBS . You can visit him at Telerad RxDx in Babusa Palya, Bangalore. Book an appointment online with Dr. Siddharth and consult privately on Lybrate.com. Lybrate.com has a number of highly qualified General Physicians in India. You will find General Physicians with more than 28 years of experience on Lybrate.com. Find the best General Physicians online in Bangalore. View the profile of medical specialists and their reviews from other patients to make an informed decision. My Father suffering from TB and his age is 59 by mistakenly my father intake double dose of combutol 1200 mg with in 7 hr of gaap it is harmful or create any problem help guide me. Ethambutol high dose can lead to eye problems. Get his eyes checked up- vision test and visual evoked potential (VEP) test. I have a bitemporal headache associated with eyebrow pain. When I expose to sunlight the pain increases suddenly it is unbearable. What might be the reason. Dear lybrate-user, headache on exposure to sun might be light sensitivity/photophobia, or migraine varety of stress induced/light sensitivity these are severe headaches that can be triggered by a number of factors, including hormonal changes, foods, stress, and envirthese are severe headaches that can be triggered by a number of factors, including hormonal changes, foods, stress, and environmental changes. Sometimes also associated with nausea and vomitting. I suggest you to take an appointment, so that detail case can be taken and rule out the possible cause in your case and proceed for treatment homoeopathy has got complete cure for these kind of complaints. I'm 24 years old i'm not getting sleep at night times. I'm feeling like giddy. I'm not eating at all. What should i do? Please advise. Take a shower at bedtime for a peaceful sleep and also start with tablet folvite once a day for six months. Hi doctor I am 23 years old. I have fits problem from 4years and I consult a neurophision doctor, he suggest valparin chrono300 tables. But phits are not controlled to me. Hi, My daughter is 1 year 11 months old. She had viral fever two weeks back and returned to normal in a week. She had polio drops on 24th February and since has a running fever which subsides and returns specially in night time. She is also teething. Is the fever related to any of these incidents? Thank you! Usually if she is active the slight rise of temperature in night need cause any worry. It can be due to teething. My friend is suffering from regular fever from last 2 months. We have done all possible tests and all are normal but still the problem is same. Kindly suggest. Need to know cheap and best ayurvedic treatment for asthma for my 9 years old daughter. What are the signs and symptoms of diabetes Type 2? What kind of treatment and diet should be followed. I think because of allergy I have everday sneezing and running nose I everyday take monocas l tablet but I do want to get of allrgy guide me. If you have Polycystic Ovary Syndrome (PCOS), eating well can help manage some of the long term complications of this condition. Read on to learn about the best nutrition choices you can make if you have PCOS. PCOS affects up to 10 percent of women. It may be genetic since women with PCOS are likely to have a mother or sister with PCOS. Women are usually diagnosed in their 20s or 30s, or sometimes when they are teenagers. There is no specific diet that can prevent or treat PCOS. However, eating well and being active can help manage some of long term complications of PCOS. The good news is that losing anywhere from 5 to 10 percent of your body weight can help with weight-related health problems. The best eating plan if you have PCOS is one that helps you manage your weight and also lower the long term risks of diabetes and heart disease. This plan should be low in saturated fat and high in fibre. Too much saturated and trans fat in the diet can lead to weight gain, high blood pressure and high cholesterol. Limit foods that contain saturated and trans fats. Instead of these bad fats, choose smaller amounts of healthy unsaturated fats, which are found in vegetable oils like canola and olive oil, avocado and nuts. Aim for a total of 30 to 45mL (2 to 3 Tbsp) of healthy fats each day. You can learn more about choosing healthy fats here. Similar to fibre, protein also helps you feel full for longer, so you will eat less. This is a great way to help control your weight. Make sure that you have some protein at every meal and snack like chicken, turkey, beef or fish. Or, try vegetarian options such as legumes, soy or a quarter cup of nuts or seeds. Milk and low fat yogurt are also good sources of protein. Try to get at least 2 ½ hours of exercise each week. Start with 10 minutes of activity and work up to longer times as your body adjusts. Review the Canadian Physical Activity Guidelines for activity ideas. Even if you don’t lose weight, exercise can help control your blood sugar and cholesterol levels and lower your risk for heart disease and diabetes.